You have to see it to believe ii. 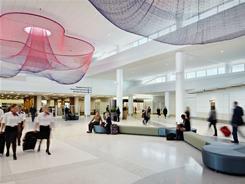 The brand new, much touted new Terminal 2 that just opened at San Francisco’s International Airport. The video news clip is interesting, but much less so than the terminal itself. It may be one of the most modern, most chic, most green airport terminals in the country, if not the world. USA Today Travel reports on such luxuries as 350 power outlets for the “laptop-tethered business traveler,” a “recomposure” zone for passengers once they have cleared security, featuring plush ottomans and bright, vivid, art exhibits, including smart phone narrations of the displays. There’s a play station for children, and even a rehydration oasis where travelers can fill their water bottles for free. The 383 million dollar construction of the outdated 1954 building was powered by American and Virgin American and the city of San Francisco as a bold move to carve out a leadership position in the competitive world of airport politics, as airports do what they must to woo airline traffic and revenue. And it’s not just the big airports that are competing for the bucks. Smaller, regional airlines, notes Tom Reich of Air Service Partners in Virginia, are a threat to the big guys too. Dallas/Fort Worth, Seattle or even San Diego are competitors. But for now, T2 is center stage. And so is Virgin’s Sir Richard Branson who is already employing Social Media to make passenger layover and waits a fun experience. Checking in at the right time could randomly earn a passenger a Virgin T-shirt or bonus miles. The bet is that dazzling “T2” and its fun-loving airline partners may make flying fun again. Wow! That’s a reason to take a trip to SFO! Thanks for informing us! Glad to be of service Let us know what you think, when you go!